U.S. Laboratory Breaks Laser Record, Delivering 500-Trillion-Watt Beam : The Two-Way That's about 1,000 times more power than United States uses at any given instant. 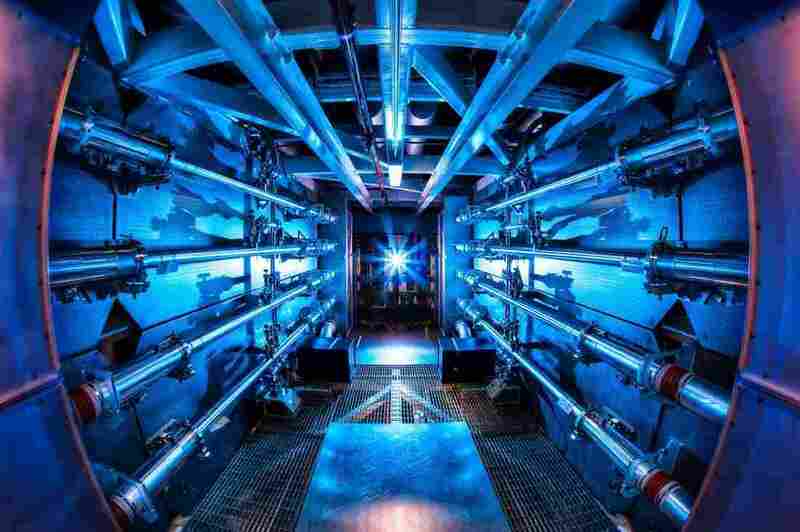 The Lawrence Livermore National Laboratory has produced a record-breaking laser beam at its National Ignition Facility. The lab's system of 192 beams produced more than 500 trillion watts and 1.85 megajoules of laser light onto a 2-millimeter in diameter target. "Five hundred terawatts is 1,000 times more power than the United States uses at any instant in time, and 1.85 megajoules of energy is about 100 times what any other laser regularly produces today." The NIF fired the lasers on July 5 and they made the announcement last week, but the news is just now bubbling up. The goal of the facility is to one day produce more energy than what is supplied to the target through nuclear fusion. "NIF is becoming everything scientists planned when it was conceived over two decades ago," NIF Director Edward Moses said in a statement. "It is fully operational, and scientists are taking important steps toward achieving ignition and providing experimental access to user communities for national security, basic science and the quest for clean fusion energy." "These conditions are similar to those in the stars and the cores of giant planets or in nuclear weapons; thus one of the NIF & Photon Science Directorate's missions is to provide a better understanding of the complex physics of nuclear weapons (see National Security). Researchers can also explore basic science, such as astrophysical phenomena, materials science, and nuclear science (see Understanding the Universe). NIF's other major mission is to provide scientists with the physics understanding necessary to create fusion ignition and energy gain for future energy production (see Energy for the Future)."